A person’s 47th birthday may not be a milestone compared to other birthdays, but it’s still a special affair because it’s a celebration of another year of life. 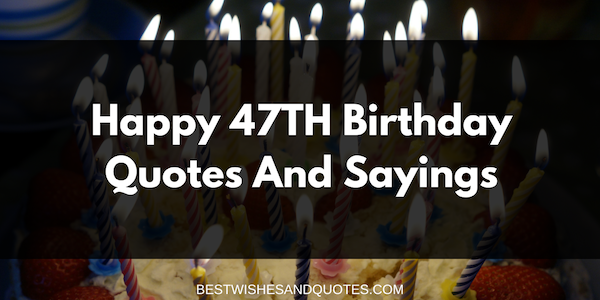 If you know someone who’s celebrating their 47th birthday soon and are struggling to find the perfect words to say, this collection of Happy 47th Birthday quotes and sayings can help you feel more inspired. All the presents in the world are simply not enough to express how much love I have for you. Thank you for all that you have done for me all these years. I know the many sacrifices that you made just to give me a good life. I will forever be grateful for having the best mother in the world. I wish you a very happy 47th birthday. I love you, Mom! You are the most special person in my life. I don’t know where I would be without your loving guidance. My wish is that you will get the desires of your heart on this special day. Happy 47th birthday, Mom! Stay as beautiful and fabulous as always. You have always been there for me. You are the only person who knows me inside and out. Thank you for being such a great dad to me all these years. Because you love me, I know I can do anything. I love you so much, Dad! Happy 47th birthday. Thank you for being such an incredible dad. I know that you’ve got your hands full, but you always make sure that you have time for me. I know how much you love me because you never forget to show me every single day. Happy 47th birthday, Dad! It still surprises me sometimes that we have become the best of friends. Growing up, we had a love hate relationship. You annoyed me to no end and you always picked on me whenever you had the chance. But growing up into has changed and mellowed us. I love how you always come to me for anything now. Here’s to many more birthdays to come. Have a happy 47th birthday! We fought and argued all the time while we were younger, but we have also overcome a lot in life together. You have proven to be the best brother and friend anyone could ever have. I wish you all the desires of your heart. Thank you for all the love, my big brother. I hope you have the happiest 47th birthday. You are such a role model to me and just the kind of brother that everyone should have. Thank you for always having my back. On your birthday, I wish you all the happiness in the world. Happy 47th birthday! We bicker all the time, and we disagree on almost anything. We fall out and then become sweet friends again. We may be enemies sometimes, but we will not trade being sisters for anything in the world. At the end of the day, we are family, and family we will always be. I love you so much, my big sister. Have a happy 47th birthday. Our lives today may be very fast-paced, but I remember the time when we were kids. Life was so simple back then. We didn’t have a lot growing up, but everyday felt so exciting and magical. We may be living in a different world now, but I will always treasure the memories growing up with my favorite and one and only sister. I love you! Happy 47th birthday! All my life, I have been searching for happiness. The kind of happiness that I felt when I was growing up with you. I miss you! I hope that we can get together soon and catch up. Happiest 47th birthday to the best sister in the world. I want to thank you for my wonderful childhood memories because you always made sure that each day was fun and exciting. You always took care of me and made sure that I was happy. Even when we were little, you were already such a great big brother to me. Here’s to many more happy memories! Happy 47th birthday! Happy 47th birthday to the best brother in the world. I would never think of wanting another brother because you alone are more than enough. I love you and may all your dreams come true this year. I’m very blessed to have a sister and best friend in you. I wish that we will always be this close until we’re old and grey. I love you so much, dearest sister. 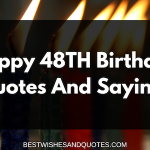 Have an amazing 47th birthday! Happy 47th birthday to the woman who owns my heart. You are the love of my life and my reason for breathing. I love you so much. May all your dreams come true today, sweet one. I wish to greet the most amazing woman on the planet a very happy 47th birthday. You are the best thing that ever happened to me and the most incredible gift that I have ever received. I am so glad that we found each other all those years ago. I love you so much. Have the best day ever. Even the rarest and most expensive gifts in the world cannot compare to your value in my life. You are simply priceless. Happy 47th birthday to the most amazing wife. I love you! I am so glad that you are my husband. I’m so happy that we chose to overcome our challenges together with love and faith, and that we didn’t give up on each other when we were going through tough times in our marriage. I will choose you over and over in many other lifetimes. I love you, my dearest wife. Happy 47th birthday. On your 47th birthday, I wish that all your wishes will come true. You deserve to have all the best things in this world because of all the love and happiness you give us. I love you so much, my dearest husband. May you be blessed with many more healthy and happy years. Happy birthday! Sometimes I think that you’re too good to be true. But I have been married to you for over 15 years and I know that this is really who you are. You are such a blessing to me, my love. I wish you all the happiness and success that this life can bring. Happiest 47th birthday. My love for you will be for always. You are the one person that I want to spend the rest of my life with. I love you so much, my husband. Stay happy and blessed. I wish that this year will be so much happier and better. Happy 47th birthday. One of my most favorite dates in the calendar has come again and I want to wish you a very happy 47th birthday! I wish you all the best in the coming year, my love. You may be a year older, but you will always be the wonderful man that I fell in love with all those years ago. I love you, hon! Seasons change, and people come and go. But one thing I can promise you is that I will always be right here. My love will forever be yours, sweetheart. Happiest 47th birthday. I consider myself truly blessed to face this life together with the person I love the most. You are one of the most incredible gifts I have ever received in my life, and I will be forever grateful to God for the gift of you. Enjoy this day, my love. Happy 47th birthday. Sometimes I still can’t believe that I get to spend every day with such a beautiful human being. I still can’t believe that I get to call you my wife. I am truly one lucky man. Happiest 47th birthday, my love. As we travel through life together, my love for you only grows stronger and deeper with each day. I am so blessed to have you as my husband. May God continue to bless you. May all your wishes come true. I love you so much, my love. Have a happy 47th birthday. I wish you love, laughter, and sunshine not just for your birthday but every day after. Happiest 47th birthday to the best friend in the world. I hope that you have the most magical day. Don’t feel so bad that you’re getting closer to your fifties. Time really does fly by so fast, but you can also make the happiest and best memories. You still have a lot of years to look forward to and live for! Have a happy 47th birthday! Forty-six really agrees with you. I hope that 47 will agree with you as well. Have a happy 47th birthday, my friend! Don’t forget to save some birthday cake for me. On your 47th birthday, I wish you more love and happiness, as well as good health and peace of mind. May you always be strong in body, heart, and mind. I love you, my best friend. Enjoy your birthday to the fullest. Happy birthday! Have a blast on your 47th birthday! May your birthday and the coming days be filled with love, laughter, granted wishes, and wonderful surprises. I love you to the moon and back! On your 47th birthday, I wish that you will feel all the happiness that you give me whenever I’m with you. You deserve all the wonderful things in this world because you are really quite extraordinary. Your heart is gold. I love you and I am so proud to be called your friend. Happiest 47th birthday to you. I know you feel like it’s too late now to make your dreams come true. Well, you’re wrong. As long as you’re alive, it’s never too late. Have the most amazing 47th birthday. God bless you always in whatever you do and wherever you go. I love you! Happy 47th birthday, you son of a really nice woman and incredible man who deserve all the love and respect for raising someone like you. Life is a book filled with many different chapters. Your 47th birthday is simply a chapter where everything starts to make sense. I hope that you have more things to be happy for and proud of in your life. Happy 47th birthday, my friend! Turning 47 years old isn’t all that bad. Especially when you have so many things to be proud of and so many people who love and care for you. That includes me. I love you so much, my friend. I wish that all your wishes will come true today. Happy 47th birthday. Every birthday is a reminder that you only get to live one life, so make every day count. Your time in this world is limited, so do everything that you want to do and love everyone you want to love. Make sure to ask permission from your wife first, okay? Happy 47th birthday, my friend. Happy 47th birthday! I hope that this birthday will be very exciting and new, just like your 20th birthday. May all your wishes come true, and may you discover new dreams to turn into reality. Don’t feel bad about the things that you were not able to do when you were younger. This is the best time to make them come true. This is the perfect moment to start fresh and achieve what you couldn’t before. Have faith in your dreams and what you can do! Have the happiest 47th birthday, my dearest friend. Make someone you love feel very special and important on their big day. 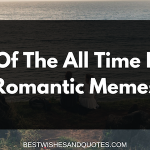 Although you can send a quick text, Facebook greeting, emoji sticker, or email, you can also do something special and send them any one of these quotes and sayings!